Shuswap Falls R.V. Club is a “not for profit” Society formed under the Societies Act of British Columbia specifically to own and manage the Shuswap Falls RV Resort. The property has been a popular camping location for decades. In 2001, the property was acquired by the Developer and converted into an RV resort where individuals purchase a Personal Use License that gives them exclusive use of a specific lot at the resort. Sales started in earnest in 2006 and continue today as the Developer still has a few lots (Personal Use Licenses) for sale. There are 132 lots in the resort; so theoretically, the Society could have up to 132 members. Some individuals have chosen to buy multiple Personal Use Licenses. While a Personal Use Licenses gives the individual exclusive use of a particular lot and a proportional share in the entire Resort, members are not on title for a specific lot. Personal Use Licenses can only be sold, willed or transferred by the cancellation of the original Personal Use Licence and issuance of a new one by the Society. Memberships in the Society are not transferable. Once a member sells a Personal Use License they cease to be a member. A buyer, upon entering into a new Personal Use License purchased from either the Developer or an existing member, then becomes a member upon approval by the Board of Directors. A transfer fee, payable by the seller, applies to such “Re-Sale”. The resort is designed as an RV park, not a mobile home park. It is not open in the winter months, although members can store their rig on the lot assigned to them year round. The Resort has been run since 2008 by an elected Board of Directors, with day-to-day management of the operations delegated to hired managers. 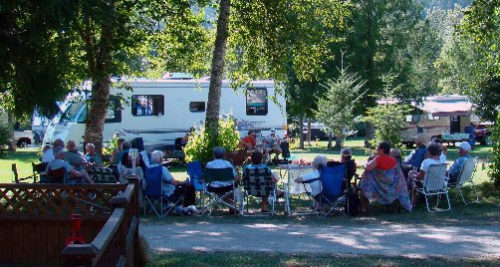 The Resort offers daily, weekly, monthly and seasonal rentals as well as a home base for all the members of the Shuswap Falls R.V. Club. Members can rent their site when they are not occupying it. The management team facilitates this as well as rentals on the remaining unsold spots. Operation of the resort is supported by annual dues paid by each member and by rental revenue.